For as long as I can remember I’ve tried to put a label on my path. In short, I’ve been looking for my tribe. Every time I try though I can’t seem to fit myself under one category. My path resists it at every turn. Multiple labels fit. Definitely Witch. Definitely Magician. Sometimes Mystic, sometimes Druid. Sorcerer. Chaote. My path revolves around fierce devotion to my gods at it’s core. I am a devotional polytheist. This is where I am happiest. I find myself at this time right back where I was 3 years ago, with three gods who refuse to be ignored, who my soul cries out to know. Three gods whom the purists may say don’t fit. Three gods who demand I make them fit, one way or the other. My inclination is to pick one and be done with it. It doesn’t work that way. There is Hekate, the witch-mother who sits at the crossroads. Hekate the Emyprean. Hekate the Chtonian. She who sometimes I can barely hear, barely feel, yet none the less, whenever I stray too far yanks me back and reminds me, I am hers. I have always been hers. There is the wild god. His antler horned visage casting a shadow over everything I do. The first sorcerer. The enigmatic one who’s image graced the first cave paintings. He who stood first and shall withdraw last. He has shown me much of his origins, and no matter how hard I try to pigeon hole him into a name, he evades it and shows me he is more than I will ever know. More than I can ever know. Dionysos. Sometimes the bull-faced one, but more often coming to me with goat horns just the same. I could be content with the other two. I’ve tried to be. Three is a crowd, but Dionysos… I worship Dionysos like Rumi loves. He breaks you down and rebuilds you. everyone knows this. When does it end though? The secret? It doesn’t. His process is unending. The birthing pains to your true self never stop. And I sing to my God, songs of love and healing. One of these things is not like the other. Or are they? Who are my tribe members? In the end my tribe wears many faces. The witches, mages, druids, folk magicians, mystics. I see worth in all of them. I hate the modern tendency to look down upon everyone who doesn’t share your label. My tribe has no one name, but I know them when I see them. Chaos reigns supreme. Nothing is True, everything is permitted? I don’t believe that (hehe). Yet in the end, once you get far enough, once you see the magic that enervates all things, every path seems like different decorating styles in an empty room. Looking at the arguments we might as well be arguing about who likes Art Deco vs Rustic in their living room. The only viewpoint that does not break down over time, is the flexible one. That’s my story, and I’m sticking to it. You are most definelty part of my tribe, as long as you don’t mind being in the same tribe as me 😉 Always a pleasure to hear from you! Thank you, I’m glad you liked it. Glad to know I’m not the only one who struggles with it, but sorry to hear you do to! It’s really a quagmire sometimes thats hard to escape from. I know what you mean, it is both a good and bad thing to know others go through it as well. I find it helps me feel less alone in my experiences, and builds a bond with others who know what I am going through. I agree, it can feel like a quagmire, but I try to focus on the things that bring me joy (even small moments) and do my best to forget about labels. I used to fight the progression of my beliefs because I felt that they had to fit somewhere, but it ended up only holding me back. This spring I started over from scratch, and have been sorting things out ever since. It has been both fun, and terrifying to look at everything I have learned or gathered and only see ill-fitting junk hanging on me, and know I need to be rid of it to grow. Well said, my friend. It is why I’ve ceased blogging…my path is too chaotic and spiraling to write about coherently. The room always holds me and continuously demands my presence, but hot damn I’m constantly rearranging the furniture. It needs to be just right. There! No,wait…there! No, hmm….. Ha! Now I’ve got it! D’oh! Thanks for the comment. I think you and I have always shared that same room-rearranging tendency. I can understand not blogging because of it. I’ve considered just quitting myself, but I know I’ll end up wanting to again some day. There’s something freeing about not having the world to be accountable to, which is why I went on a long blogging hiatus to begin with. Wishing you luck on your path always my friend. But in all seriousness, I agree with darkbookworm's comment. Many thanks Letiomlin! It can indeed be hard to stick to the view point sometimes. Many thanks for staying with my long ramblings! I do poorly with labels as well. 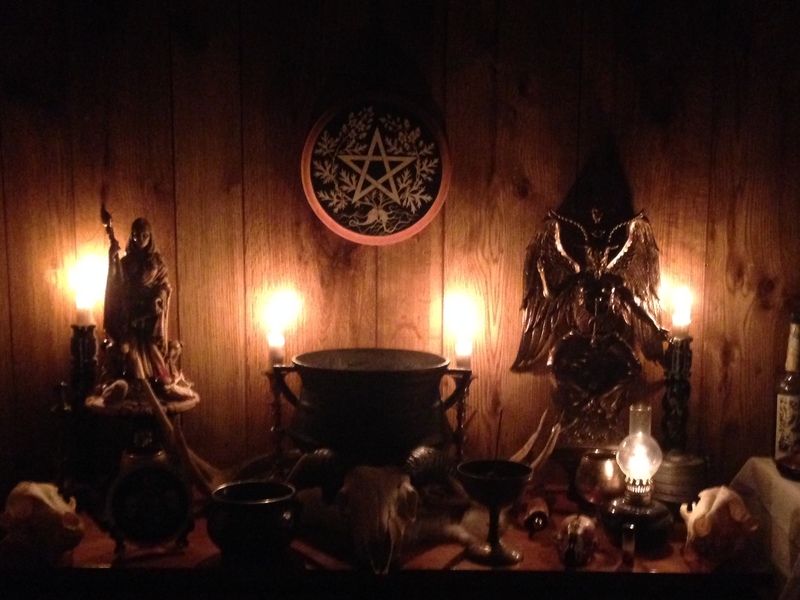 I am a skeptical polytheist; in as my most common saying is “Either all the gods/goddesses exist, or none exist.” I feel a profound affinity for the Horned One, and for Hekate as well, but I don’t think “devotional” would be applied to most of my life, since I do ritual seldom, instead preferring the attempt to maintain what I call “sacramental living” –the deep embedding of what I view as sacred into my everyday existence. It is all, to me, a glorious Dance in between this mortal coil and the Unknown that beckons! I like your viewpoint. That’s the beauty of it isn’t it? We each have our own way! Many thanks for sharing! Diversity is more than just selling point on a website, don’t you think? Oh i would most definitely agree! Thank you Rachel! Your thoughts and friendship are always appreciated. Thanks to Rachel for pointing this post out. And thanks to you for writing it. It’s always good to know we aren’t alone. When there are so many who insist that we adhere to “this” or “that,” it is harder to express a devotion that is hard to pin down. Nonetheless, we answer to our gods, not to labels. I wish you great things as you continue to stay true to who you are. Well thank you for your eloquent comment! I truly enjoyed reading it! I wish you the best as well! Many thanks for taking the time out to read it and reply here. Good post, Skyllaros! I’ve often felt a similar way. When I was a Wiccan practitioner, I didn’t ever really feel like I fit in with that crowd, and when I went into Ceremonial Magick, I didn’t fit in there either. Chaos Magicians, while usually personable, seemed too Occult Couture. I like the blended path I have now, as well as the term Sorcerer. Personally, I feel like you and several others I’ve met online are more of my “Tribe” than I’ve ever truly encountered. I sincerely thank you Ocean. It has been a pleasure getting to know you and the others in our little internet cabal. I proudly consider you part of my tribe! The Tribe issue is different to me than the Label issue. My Tribe is made up of all kinds of practitioners, witches, ceremonialists, sorcerers, Buddhists and Christians of a certain bent…as well as musicians, visual artists, authors, dancers, etc…. I am quite similar- Hekate brought me to so many different paths over the years. And i think i am more at home on the crossroads where different paths and traditions do meet each other. And i think it is a fitting place for me.